Listening to, or reading the news everyday, can only leave the impression that the world is spiraling downward in a degenerative state of decline. And with all we see and hear, our degeneracy is accelerating. And humanity is accompanying the world in this accelerating deconstruction. There seem to be two problems with this perception. First, is that the impression is false, since it’s emotionally driven; devoid of quantification which provides the relational perspective of rationality, and secondly, it’s entirely driven by the most salacious headlines and other nefarious elements that prey on our emotions. 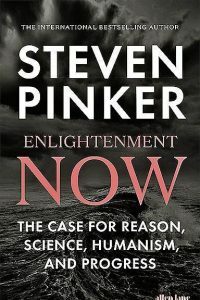 Pinker’s underlying premise is that science and technological advancement have contributed significantly to improvement of the human condition. Easily two thirds of the over 500-page book is quantitative data used definitively to validate his premise. He is addressing the temporal or physical condition, not the spiritual or cultural, which is clearly in decline. As he says at the outset, “How can we soundly appraise the state of the world? The answer is to count.” And count, he does. 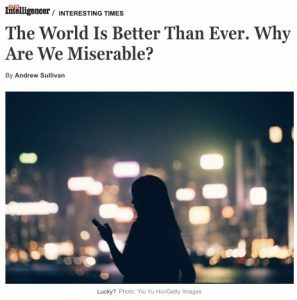 His voluminous data documents how globally, mankind is improving in nearly all of the critical areas that we’re bombarded with in the media on a daily basis: health, wealth, inequality, the environment, peace, democracy, literacy, longevity, and even social issues like racism and violence. In each of those areas, mankind is better off today than at any juncture in human history, mostly due to technological advancement and rationality. It must be discomfiting to Pinker to invalidate most of the social and governmental premises of liberalism. 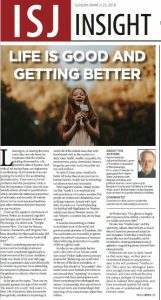 But the conclusions are impossible to ignore given the author’s voluminous historical data evidencing amelioration in quality of life on a global scale. So why do we collectively harbor such a dim view of our human condition today? 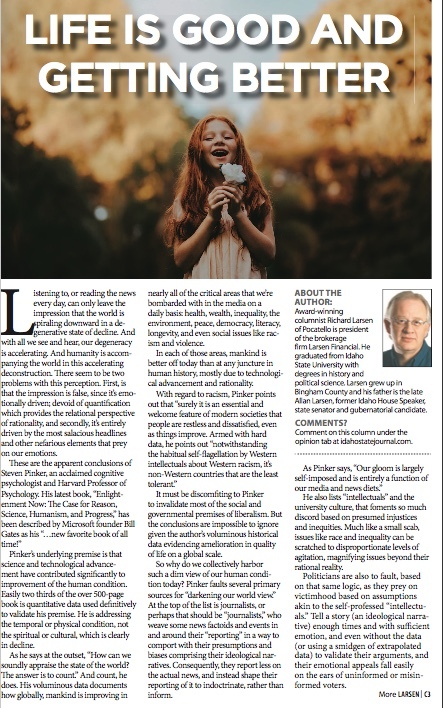 Pinker faults several primary sources for “darkening our world view.” At the top of the list is journalists, or perhaps that should be “journalists,” who weave some news factoids and events in and around their “reporting” in a way to comport with their presumptions and biases comprising their ideological narratives. Consequently, they report less on the actual news, and instead shape their reporting of it to indoctrinate, rather than inform. He also lists “intellectuals” and the university culture, that foments so much discord based on presumed injustices and inequities. Much like a small scab, issues like race and inequality can be scratched to disproportionate levels of agitation, magnifying issues beyond their rational reality. Politicians are also to fault, based on that same logic, as they prey on victimhood based on assumptions akin to the self-professed “intellectuals.” Tell a story (an ideological narrative) enough times and with sufficient emotion, and even without the data (or using a smidgeon of extrapolated data) to validate their arguments, and their emotional appeals fall easily on the ears of uninformed or misinformed voters. Then transitioning from political populism to actual governance, he explains, “In policymaking, reason is the only thing that we should appeal to. But reason can take into account human emotional responses. 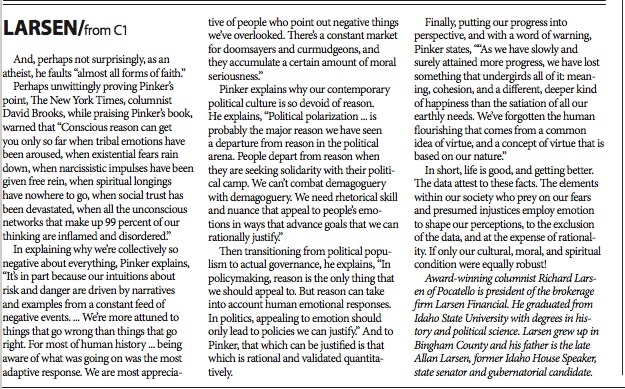 In politics, appealing to emotion should only lead to policies we can justify.” And to Pinker, that which can be justified is that which is rational and validated quantitatively. 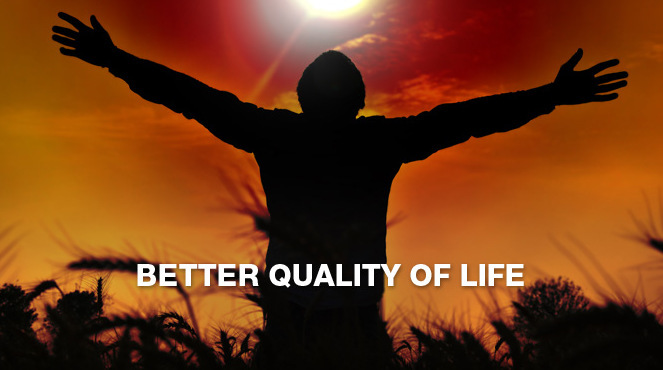 In short, life is good, and getting better. The data attest to these facts. The elements within our society who prey on our fears and presumed injustices employ emotion to shape our perceptions, to the exclusion of the data, and at the expense of rationality. If only our cultural, moral, and spiritual conditions were equally robust!